The MGA Twin Cam was announced in 1958 and was the product of a lengthy and involved development but disappointingly it returned one of the shortest production runs that Abingdon had ever seen. This certainly makes the car somewhat a rarity with only 2111 cars being produced between early 1958 and early 1960. The twin cam was to utilise an engine that was never fitted to any other car and was developed from the B series unit, prior to this the PB was the last MG to use an overhead cam engine in 1936. For ease of production, economy and reliability the standard pushrod type of engines were used by MG from then on, but it was evident that performance suffered as a result and it was when the Abingdon engineers became frustrated at trying to extract more than 60 bhp from the B series Austin-derived engine, that was currently powering the MGA and Magnette cars, that attentions were turned to the production of an overhead cam unit. The Company was also keen to get the name of MG back into serious competition, particularly racing, as this had been shelved some years previously during the Nuffield rationalisation. It was Gerald Palmer who was a design engineer at the Cowley plant who originally set the wheels in motion for a twin cam conversion of the B series engine. In his plans he set the two lines of valves at 90 degrees symmetrically opposed and it was intended that as many of the existing B series engine components as possible should be utilised. The basic designs were then handed over during 1954 to the Morris Engines Division at Coventry to be developed further. It was not until the summer of 1958 that any production units were available for fitting into the MGA and therefore the development work was quite a protracted affair. There was however a prototype twin cam engine which appeared in an MGA that competed in the Dundrod Tourist Trophy Race in Northern Ireland as early as September 1955. At that time there was also another prototype twin cam engine that was under development by the Austin engineers at Longbridge and this too was scheduled to power an MGA in the same race, but due to rev limitations and carburation problems the car never appeared. The Austin unit was a totally new design and not based on any other existing engine with the valves inclined at an angle of 66 degrees it proved to be a very smooth engine that also fitted well into the MGA engine bay. This particular engine however was very short lived and apart from running EX 182 at Le Mans it was never to be seen again. The Morris twin cam was not to achieve any success in Northern Ireland due to mechanical problems although it was considered promising enough to form the basis of a new production car and development was started more or less immediately. Further development engines appeared in EX 179 and EX 181 record cars during 1956 and 1957 before the final production version was ready in the summer of 1958. These units were, as Gerald Palmer had intended, based on the B series block, albeit with many changes. The unit was bored out from 73.025 mm to 75.4 mm giving a capacity of 1588 cc, this was to take advantage of certain competition regulations, the bores being siamised. The crankshaft had narrowed main bearings and an extended nose to carry the timing chains, whilst the con rods were considerably strengthened. Heavily domed pistons were fitted to these con rods to allow a very high compression ratio of 9.9:1 which meant that the engine had to run on high octane 5 star fuel in order to get the best performance. A special light alloy cross-flow cylinder head carried twin overhead camshafts with valve operation via Coventry Climax style inverted bucket-type tappets. Hemispherical combustion chambers had two valves per cylinder operating at an included angle of 80 degrees. The front of the engine displayed a very complex looking alloy casing which housed the drive gear and duplex chains for the camshafts and distributor. Two smart looking alloy cam covers adorned the top of the cylinder head whilst a large finned aluminium sump helped to keep the lubricating oil cool. The carburation was by 1 ¾ " twin SUs with flexibly mounted float chambers and they appeared on the left hand side of the engine as opposed to the right hand side on the standard pushrod engine. New manifolding was produced with separate downpipes for each cylinder making the engine unit look very business like. At the end of the day the impressive results achieved from all this lengthy development on what was basically a B series block made the exercise worthwhile. A very healthy 108 bhp @ 6700 rpm together with a maximum torque figure of 104 Ib ft @ 4500 rpm meant that the new MGA Twin Cam was to be no slouch! 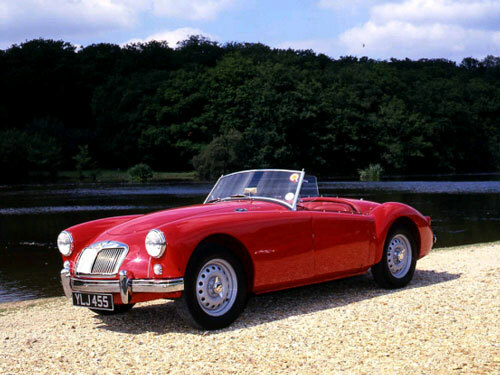 There were other obvious changes that were made to the MGA in producing the Twin Cam. The Chassis did differ slightly to that of the 1500 MGA and there were important changes to the brakes and wheels. In view of the 113 mph performance attainable, Dunlop 103/4" disc brakes were fitted both front and rear together with Dunlop centre lock disc wheels carrying Dunlop Road Speed tyres. Wire wheels were not available as an option. The brakes were different to any other type of system used on MGs previously and due to the large braking surface area of the discs they were most efficient and did not require servo assistance. One drawback of the system however was the relative inefficiency of the handbrake which worked on the rear discs by means of a separate calliper with small pads and a pivot system that readily seized up without regular maintenance. Externally there were virtually no visible differences in the body compared to that of the MGA 1500 with both a roadster and a closed coupe being available. It was really only the wheels and the discreet Twin Cam badges that were fixed to the top bonnet surround adjacent to the air intake grille and on the boot lid below the MG Octagon that betrayed its identity. The instrument layout was almost the same as the MGA 1500 but with a tachometer that read 7500 rpm and a speedometer that took account of the top speed of 113 mph. The instrument fascia panel was given a face lift, being tastefully covered in leather, whilst leather was also employed on redesigned, better padded seats o.f the bucket type. These seats however were only fitted to the roadster as the coupe had a slightly different design that gave more support and were known as 'De Luxe seats'. Problems with reliability very early on in its production life affected the sales of the Twin Cam quite markedly and despite its sparkling performance the car was regarded as a commercial failure due to its cost, reliability and stiff competition from Triumph in the form of the TR3A and Austin Healey with their 100/6. Both these cars offered better performance and the Triumph was significantly cheaper by some £144. Abingdon's biggest problem was the poor reliability which in the main was caused by the very high compression ratio necessitating perfect ignition timing and the use of top grade fuel. With either not at their optimum, holes could very easily be burnt in the pistons. This coupled with the engine's large appetite for oil caused by chromed rings and chromed bores soon earnt the Twin Cam a bad reputation. These problems were attended to by Abingdon but only just before production ceased in mid 1959. In the short production life of two years only 2,111 examples were produced, 1,801 of which were roadsters. There is no doubt at the time, the Twin Cam was a car that Abingdon was not particularly proud of, but today the car quite rightly has its niche in the MG history book and is a much desired classic. Engine: Four cylinder, in line, cast iron block, alloy head. Valve gear: Twin overhead camshafts with shim adjusted bucket tappets. Transmission: Four speed manual gearbox with synchromesh on 2nd, 3rd and top. Clutch: Borg and Beck dry plate. Suspension: Front - independent by coil springs, wishbones and Armstrong lever arm dampers. Rear - Live rear axle, half elliptic leaf springs, Armstrong lever arm dampers. Wheels and tyres: Duniop pressed steel centre lock disc with 5.90-15 Dunlop cross ply tyres. Brakes: Dunlop disc brakes front and rear 10.75" diameter discs.